A game which was ultimately decided by a scrappy goal from a set piece. There were plenty of chances for both teams throughout the game as neither of them could stop the other’s offensive strategy. Newcastle’s man-marking in defense and Arsenal’s lack of pressure on the ball made this and open game. In Arsenal’s build-up phase it was Ramsey who dropped most frequently into the defensive line to provide stability in the first line and try to move the team forward. Whenever he did this, he would be followed by whichever Newcastle central midfielder was closest to him – this is what most obviously revealed Newcastle’s man-marking scheme. Colback moved out of his deep central position to follow Ramsey earlier in the game, but it was most often Wijnaldum who was closest to him as he played right behind Mitrovic up top. Wijnaldum man-marked Ramsey in a more loose sense of the term as he frequently looked to put Ramsey in his cover shadow while pressing one of the central defenders (if Ramsey hadn’t dropped deep yet). Tiote as the deepest central midfielder most often marked Ozil while Colback marked Flamini for most of the game. Newcastle’s fullbacks also man-marked Arsenal’s wingers and followed them into the center of the pitch whenever they moved inside. This Newcastle side is the team which most heavily relies on man-marking that I’ve seen in the EPL in a while, which might explain their lack of stability and poor results recently. This type of defending ultimately left them vulnerable to vacating important spaces due to Arsenal’s rotations and being unable to track runs off of the ball. The most frequent and dangerous breakthroughs occurred when Ramsey (or another of Arsenal’s central midfielders) would be followed deep and open the center while Oxlade or Walcott (whoever was playing on the right flank at the time – as they switched flanks throughout the game) moved into the opened central space to receive the ball and drag their fullback inside with them. This left Bellerin isolated again Perez on the flank with space to run into – and Bellerin would make runs from deep which were difficult to track during Arsenal’s halfspace combinations and was played through the defense in the end and broke into the box for dangerous crosses. Arsenal is particularly difficult to man-mark and remain stable while doing so due to their heavy reliance on quick combinations out of poor positional structures. Poor spacing in possession obviously isn’t something you want in every game – but if your opponent is following you while you have poor positioning, they’re inevitably going to leave some huge holes open which have the potential to be exposed by Arsenal’s dribbling and combinations. For example, in one scene both Flamini and Ramsey were very far on the left side of the pitch (don’t ask me why) and they were followed by Wijnaldum and Colback which left the entire center of the field open. Giroud dropped off into this space (central defenders didn’t want to follow him so deep) and was able to turn with the ball and play a diagonal out to Oxlade who was supported by Bellerin to attempt to break into the box. Tiote would even go as far to move away from the direction the ball is moving while the team shifted across the pitch in order to mark Ozil, this obviously left the near-side halfspace wide open, and Giroud did well to drop into this space and combine with Chamberlain to potentially breakthrough the wing or move towards the center. Both Ozil and Giroud took advantage of the Newcastle fullbacks man-marking Arsenal’s wingers and frequently made runs down the side of the field into open space to push The Gunners up the pitch. Arsenal’s defensive block was the usual 4-4-2 with Ozil and Giroud up front. Both Ozil and Giroud weren’t very active once the ball bypassed them, meaning Arsenal’s first line of pressure was most often taken out of the game quickly. The block itself wasn’t poor in regards to the positioning, but the compactness of pressure did not exist. For example, I could stand closely in a midfield line with MR and RM, but if the ball is getting close to me and I don’t pressure with intensity and they don’t seek to double/triple up and help me pressure – we will have problems stopping the opponent from moving the ball how they want to. Within/around a compact team’s block the ball must always be under pressure from the collective defense – which results in forcing a ball loss or a favorable outcome. Newcastle often progressed into a 3-4-2-1 structure in possession out of their 4-3-3 type shape. Tiote dropped between the central defenders while the fullbacks pushed high up. This allowed Perez and Sissoko to move inside toward the halfspaces while Wijnaldum and Colback occupied the center of the field and Mitrovic remained as the central 9. The base of 3 played out of the back quickly bypassed Arsenal’s front 2 as I mentioned earlier due to no real intensity or support. Newcastle very easily gained space against Arsenal and forced them into a deep shape where they could implement their go-to offensive strategy. Newcastle looked to move close to the box and then play long diagonals to the far post with multiple runners overloading that area. Mitrovic was particularly dangerous in this regard as he got his head onto a few balls but wasn’t able to connect properly enough – but the warning signs were there. Even though Newcastle were able to use Colback and Wijnaldum in the center to avoid pressure and provide stability to the circulation through central areas, they had connection problems (particularly on the flanks). The wingers would mostly be supported only by the fullback – especially on the left flank early in the game – which resulted in predictable passing and Arsenal was able to force the circulation back towards the goalkeeper and gain control of valuable space. Had these two isolated wing players had better resistance under pressure and dynamic movement in combination with each other, Newcastle would’ve been much more dangerous for Arsenal. Though when Colback or Wijnaldum properly supported the flanks the team was able to take advantage of Arsenal’s poor pressing out of midfield and launch diagonals towards the far post quite often. After the goal Arsenal immediately switched to a deep 4-5-1 press in an attempt to crowd the center and hopefully establish some better access to the ball there. Newcastle progressed into a more aggressive positional structure in a 3-2-4-1 where the right fullback pushed very high up as the right central defender moved wide, the left fullback remained on the left, and Colback and Tiote dropped next to the lone central defender in the middle. Perez moved inside from the left flexibly while Sissoko and Wijnaldum played in the center and Mitrovic remained up top – this ultimately didn’t yield any results but was an interesting progression which Newcastle should look to try again in the future. The rest of the match was uneventful – Newcastle’s brightest moment came when Ramsey received the ball and turned while being man-marked in the defensive halfspace and then played a poor pass to Ozil towards the right wing where Perez intercepted the ball, dribbled diagonally inside, and played a through ball into Wijnaldum who missed a 1 on 1 opportunity against Cech. 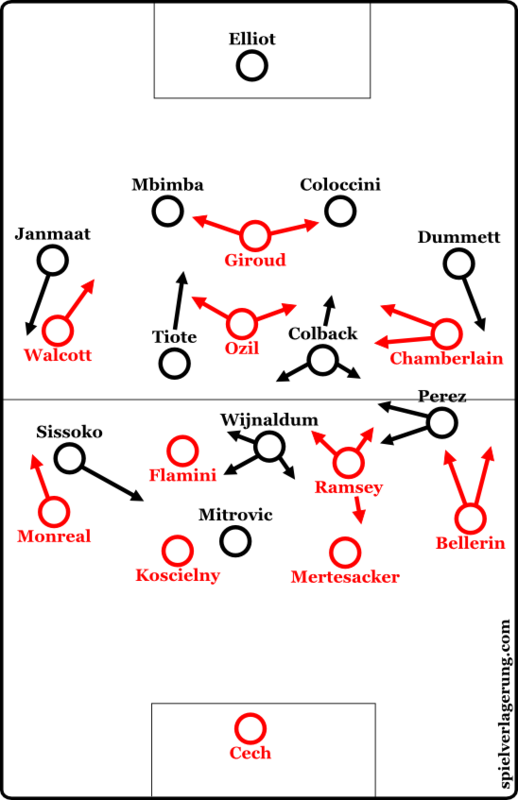 This was an example of poor group tactical movement from Arsenal. Nevertheless, Arsenal obtained 3 more points in the league and are now 6 points ahead of who many consider to be their main competitors for the title – Manchester City.